At the top of a very tall hill stands a lonely snowball in a tiny yellow hat. As he stares down at the little town miles below him he decides that today is the day his life is going to change. He’s going to leave his quiet hill and go and find some new friends to have fun with. As he takes the first few steps towards this new adventure he trips and falls – and starts rolling down the hill! Being a snowball, he gathers more snow as he rolls. Getting bigger and faster, his descent is soon out of control! His big snowy body collects things as he rolls – first some twigs and a pebble, then a sheep, some pants and even an acrobat team. Even rolling through the zoo doesn’t slow him down. What will happen when he finally reaches the bottom of the hill and will he make the new friends he so needed? 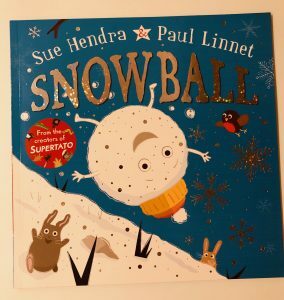 This book is really well written and has a lovely bouncy rhyme which speeds up as the snowball gets faster. Ivy loves the illustrations and finds all of the people, objects and animals caught up in the snowball really funny. She likes to make a game of all the things she can spot poking out of the snow. One of our favourite books so far this winter!